Title: 'Charte von Polen Preussen u. Galicien '. 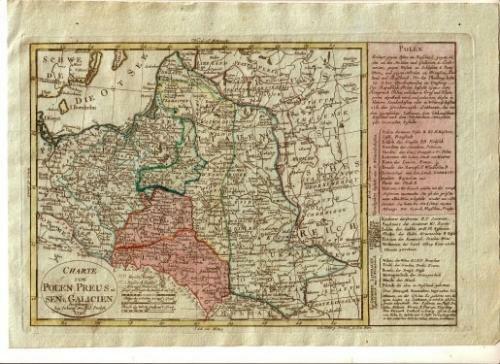 A small and intricate map of Poland and Lithuania. "Johan Michael Probst, the Elder (1727-1776) worked as map engraver and publisher in Augsburg. After his death the firm was continued by his son Johann Michael Probst the younger (1757-1809). His brothers Johann Georg Probst (!759-1809) and Johann Konrad Probst (1762 -1820) worked for him as map engravers. The Probst brothers did not marry and had no children, so the firm ceased to exist with their death"(Babinski [ix]).